1. Are the chemicals being used harmful? Our pest control operators are trained to ensure that they are knowledgeable and responsible in handling pesticides. The pesticides that we use are EPA registered and can be used with little or no impact on people, pets or plants if used in accordance with labeled directions. If you have specific medical conditions or sensitivity, ask your pest control operator for the MSDS sheets that contain active ingredients, level of toxicity and information that you can discuss with your doctor. 2. Why should I hire a professional pest control opertator when i can do it myself? There are some do-it-yourself stores that sell similar products. However, most homeowners lack the knowledge and training that we have to treat pest problems effectively. We will identify the correct insect species and formulate a treatment plan that take the insect's biology and habits into account. It is critical that the chemicals used are handled properly. If you do choose to handle your pest problem yourself, be sure to follow all label directions carefully. 3. 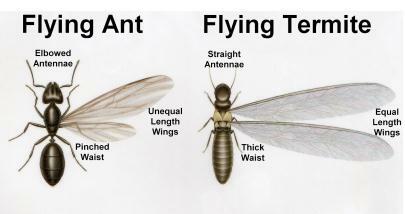 How can I tell the difference between flying ants and termites? Termites are often confused with ants; however, there are obvious differences. Termites have a broad waist and straight antennae, and both wings are the same size. Ants have a thin, pinched waist and elbowed antennae, and their hind wings are smaller than the front wings. 4. How do I get termites? 5. What happens if I ignore the problem of termites? Termites do not go away. Termites eat 24 hours a day, 7 days a week. Subterranean termites have extremely large colonies and if your home is the only source of food they have, they can do a lot of damage fast. Don't wait if you have these. Formosan termites are the most dangerous and destructive termites found in the United States. They can literally eat you out of house and home in no time at all. A single colony of Formosan's is capable of consuming up to 2 pounds of wood per day. They must be exterminated immediately. 6. Why do I need a termite inspection to sell my home? State laws require that sellers disclose any problems that a home may have. Termite and wood destroying organism problems are included. A lender will usually require that wood destroying infestations be eliminated before funding the loan. The Wood Destroying Insect Report must be done within 30 days of the loan closing.